The loss of this species would be an unimaginable catastrophe to the soul of mankind. Sometimes there is no good solution to a problem. However, its very existence plumbs the depths of the human psyche. I am referring to reaction to the need for humane horse slaughter. The United States banned horse slaughter seven years ago but may, if Congress will provide funding for inspections, reintroduce the practice. This is due in part to drought and overpopulation in the West, which has created a rising number of starving horses. However, slaughter houses may harvest meat for human and animal consumption in other countries. Because there is an operation in New Mexico applying for a permit, this issue was on my mind when I visited the St. James Hotel in Cimarron earlier this month. I was looking around at all the trophies of bulls, bison, deer, elk, antelope, and mountain lions on the walls. One gets accustomed to this display, but it reminded me that I have never in my life seen the head of a horse mounted. The issue took me back to a book read years ago, Horse: How the Horse Has Shaped Civilization, by J. Edward Chamberlin. The author is a professor of English at the University of Toronto and has bred and studied horses for most of his life. Chamberlin explains that the imaginative bond humans forged with this animal is visible in art 35,000 years old in the caves of Chauvet in France. Humans were hunting horses for food back then, but after the killing the memory of horse stirred the imagination of artists and has continued to do so throughout the ages. It was the way they move that fascinated, Chamberlin says, “not how fast or how high but how well, how wonderfully well. Or not.” He adds that the best trainers are those who pay attention, who watch. They are able to make a horse do what they want by the quality of their attention. Of course the time came when men realized that they had a tremendous advantage in warfare on horseback, and Alexander the Great was not only a brilliant warrior but a horse whisperer. Chamberlin shares the story of the stallion Bucephalus that his father, Phillip, was about to reject for viciousness. At age twelve, Alexander asked to train him. He had noticed that Bucephalus reacted when anyone closed in on him, so Alexander turned the stallion to face the sun. “Bucephalus stood quiet;” Chamberlin writes, “the boy jumped on his back—and into history.” According to legend, Bucephalus lived until age thirty, and Alexander valued him so much that he named a city after him. War took a terrible toll on horses. The evolution was from fast horses for raids to horses for chariots and war wagons to horses for cavalry to the “great horses” of knights, and then back to horses for cavalry even into the era of gunpowder. For thousands of years, horses were bred for warfare, suffering terrible hardship on long campaigns and dying horrific deaths alongside the men whom they had served. They also served Christians and Muslims who turned a spiritual mission to “convert the unfaithful” into a military one. It was Muhummad who valued horses most in this endeavor, and the Arabs took better care of their mounts according to Chamberlin and were probably better horsemen than the Europeans. In fact, Muhammad made the care of horses a religious obligation, writing that on Judgment Day “a horse’s hunger and thirst, the water he drinks, the food he eats, every hair on the animal, the least step he takes, and even his urine and dung will be weighed in the balance.” For Westerners who value horses, there may yet remain common ground in this regard. And then horses traveled to the New World in slings on sailing ships. Some were pushed overboard to drown when ships were becalmed and running out of food and water. Among those who survived passage, some escaped and became the wild mustangs tamed by Apaches, who did things on horseback that amazed even the Spaniards. Their history is fascinating, and a common thread runs through it of all the ways in which they served the largest ambitions of mankind. There is one picture in the book that beautifully symbolizes the sense of power they endowed. It is known as one of the greatest horse paintings of all time, and it was done in the eighteenth century by George Stubbs. It is a painting of a stallion named Whistlejacket rearing from a “lavade” as though to lunge at the enemy. In fact, the stallion was a handful. 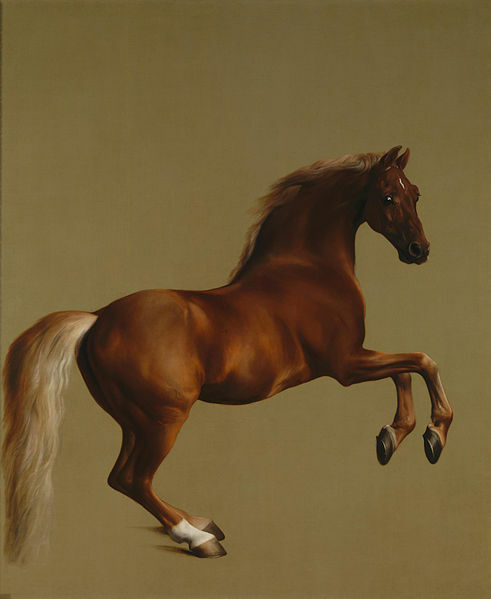 The story goes that when Stubbs left the painting leaning against the wall, Whistlejacket turned as though to attack it, and his groom briefly dangled from his bridle. The history of the horse speaks volumes about human ambition, or should I say masculine ambition. I know some very fine horsewomen, but I think it would be fair to say that intimacy with the strength, speed, agility, grace and freedom the horse endows has been preponderantly the experience of men. I have horse knowledge in my genes but not much in my experience, and I admit to being envious. I have mixed feelings about the warfare, the conquest, and the way training and competition have stressed and injured horses, but I also admire things about that as well. The horse has sometimes amplified the shadow of men, but then when I see someone like Buck Brannaman training one or my brother the veterinarian working on one, I believe that they have brought out the very best in them as well. There is a bond between the two like no other, and a slaughterhouse does not belong in the story. Another great blog Ellen. I hardly dare read it as I feared the equine slaughter house project in NM had been approved. Believe me it will never be humane – any more than the BMW wild mustang roundups are. Everyone must protest against this criminal institution. You may also be interested to read the information on The Spanish Mustang Foundation’s website – spanishmustangfoundation.org with whom I worked for a while. They have made an amazing documentary about the origins of the horse and it turns out this beautiful animal is indeed indigenous to America. The completed documentary was screened last year at CAA. I hope people will be able to rent or buy it, as sadly the general population is still very uneducated about the history and the plight of this magnificent creature. The deep emotion expressed here corralled me as well.